Updated CGPSC Assistant Professor Syllabus 2019 to be read by the postulants who are writing the Chhattisgarh Assistant Professor Exam. This page along with the syllabus pdf, CG Assistant Professor Exam Pattern is included. The answer to the question How to complete the psc.cg.gov.in Assistant Professor Syllabus in the short time is found after seeing this whole post. This CG Assistant Professor 2019 Syllabus is providing in view of the upcoming competitive exam. When the CGPSC Assistant Professor Syllabus download is finished, plan the schedule of preparation to cover up all the topics. 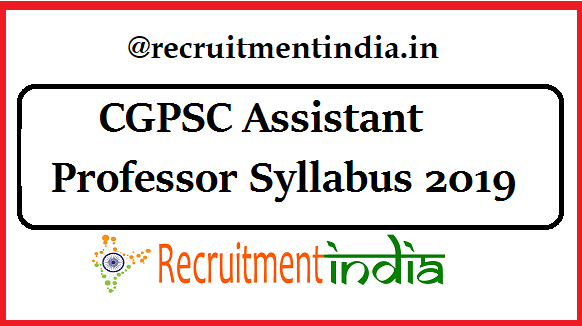 Start reading for the CGPSC Assistant Professor Examination 2019 once you have found the latest CG Assistant Professor Syllabus 2019. The main cause of posting this syllabus at present is the CGPSC Assistant Professor Recruitment exam notification is delivered recently. As the registration of the exam is continuing till the last date, you guys have to begin the CGPSC Assistant Professor Syllabus 2019 reading from today itself. To study all the topics that will appear in the exam you have to do the preparation most of the times. Save a lot of time for reading the CG Assistant Professor Exam Topics. Below of this page subject wise syllabus is given to you. Chhattisgarh State Public Service Commission in its main site only uploads the CGPSC Assistant Professor Syllabus All Subjects in Hindi. Even the aspirants also choose the syllabus that is provided in the Hindi language only. Thus you get the very crucial Chhattisgarh Assistant Professor Syllabus directly from the CGPSC page. Having the knowledge on the specialized subject which the applicant has chosen in the application form make the applicant to perform well in the examination. Entire CGPSC Assistant Professor Selection Process is for 330 marks. In that 330 marks, the online exam is conducting for 300 marks and the interview is for 30 marks. After grasping the marks allotment in the Chhattisgarh Assistant Professor Exam Pattern, commencing the syllabus preparation is the right thing. Then only the strategy of scoring the marks will get into the minds of the applicants. Without the assistance of the CGPSC Assistant Professor 2019 Exam Pattern in spite of reading the given syllabus, they might not get the good score in the exam. That’s why everytime we are advising you after proper research of syllabus, exam pattern, study material start the preparation. Qualifying in the CG Assistant Professor Exam and getting the job is not so easy. Applicants, scoring of highest marks in the exam have to keep as the target when you are in the studying process. Procedure to execute the vast CG Assistant Professor 2019 Syllabus pdf Hindi has to be made by the competitor in a smart way. Check out the CG Assistant Professor Previous Papers for some idea. Two points are to be practiced by every candidate who is going to give this Chhattisgarh Assistant Professor Exa. They are one having the highest accuracy of answers in the final exam and the second one is within the shortest time they have to get the right answer for any question. Whoever follows these two tips can see their name in the merit list of candidates. The candidate who doesn’t have a clear vision regarding the updated CGPSC Asst. Professor Syllabus in psc.cg.gov.in will get it after seeing this page. Then guys, why are delaying the downloading of CGPSC Assistant Professor Syllabus pdf, get it fast and read.